Close up blood sugar test. Woman self-testing for diabetes. Blood sampling for glucometer. Insulin molecule, rotating space-filling model, seamless loop. Adrenal Fatigue word cloud on a white background. Woman diabetic with a syringe and insulin in hand close-up. Woman using lancet and glucometer to mesure blood sugar. Closeup self-testing for diabetes. Diabetic girl checks the blood sugar level with a lancet. Woman self-testing for diabetes. Blood sampling for glucometer. Close up using of lancet on female finger. Drop of blood on finger. Measurement blood sugar. Doctor tells girl a diabetic patient how to correctly dial the insulin into the syringe. Female doctor talking to patient in hospital. Doctor tells the patient how to take the medicine. Close-up of insulin syringes, blood glucose meter and insulin on the grey background. Slow motion. Movement of the camera from the bottom up. Glucose animated word cloud, text design animation. Kinetic typography. 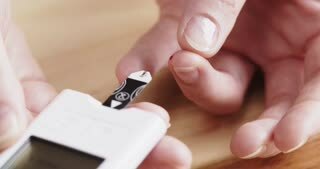 Close-up of woman checking blood sugar level on glucometer at home, close-up on a white background. Girl measures the blood sugar level on glucometer. Glucometer for measuring blood sugar close-up on blue background.